Use double-sided partitions to divide, organize and customize any work space or display area. 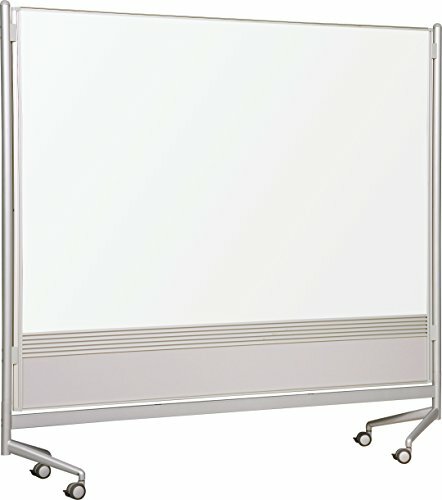 Double-sided partition has a dry-erase marker board on both sides. The leg design allows panels to be joined together and plastic connectors are included to join the panels together in a variety of angles. The aluminum slat wall panel at the bottom allows you to attach accessory trays (sold separately) where you want them without fasteners, clips, or hooks. Partition includes four locking casters for mobility. Mobile double-sided dividers come in a variety of surface combinations, including porcelain steel magnetic marker board, Evolution projection board, Dura-Rite HPL marker board, natural cork, hook and loop, and decorative laminate. Panels are trimmed in modern anodized aluminum, including a slat panel for optional accessory trays, and include locking casters. PLeg design minimizes gapping, and connectors are included to join panels at 90 Degree or 180 Degree angles. If you have any questions about this product by Best-Rite, contact us by completing and submitting the form below. If you are looking for a specif part number, please include it with your message.